The team partnered with International Sports Federation to minister to the people of Slovakia as part of the Tiger Athletic Mission Experience program. “We were thrilled to have the opportunity to serve in Slovakia and excited for what the Lord had in store not only for the people we encountered, but also for our Tiger hockey players,” said Ryan Erwin, vice president for athletics at ETBU, who led the group along with Head Coach Alain Savage and Lisa Seeley, director of the Great Commission Center and Global Education at ETBU. International Sports Federation is a faith-based nonprofit organization that has developed an international network for sports missions with more than 750 missionaries around the world. “During our time in Slovakia, we served in a number of different ministries providing shelter, clothing and food to the homeless of Bratislava,” Seeley said. “You can imagine the great need to help the homeless when the alternative for them is to sleep outside in temperatures that drop into the teens at night. 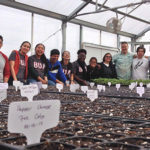 “We had the privilege of connecting with a few residents, hearing their stories and the instrumental role God has played in their lives,” said Michael Garvie, a senior at ETBU. “One takeaway I had was a response from one of the older residents to our question, ‘Who is Jesus to you?’ He responded: ‘My faith is everything to me. Without it, I would not have any of this and would not be here.’ This came from a man without money, a job, and with challenging health issues. During the nine-day trip, the Tigers competed against a local junior team, a semi-pro adult team and the 2018 European University Hockey League champion. Following each game, the ETBU hockey team distributed Bibles to the opposing team members. The teams also spent time in fellowship and serving alongside one another. The trip to Slovakia was the eighth Tiger Athletic Mission Experience, which provides student-athletes the opportunity to use their God-given talents as a platform to connect with people and share the gospel of Jesus. ETBU Women’s Soccer Head Coach Kristin Cox will take her team to Costa Rica in early March.